Hello. Yes. I’ve been quiet on here for the past year. The double-handed RB&I was brilliant. Did well AND made friends. Now in Falmouth with many of those friends, and a whole bunch of potential new ones, preparing to set off towards Ponta Delgada in the Azores. The weather models are uncharacteristically agreeing that it will be a fast and furious 1200 miles. Feel free to follow the race. We may also tweet, but no guarantees. Catch you on the other side. This entry was posted in Uncategorized on June 5, 2015 by Kass Schmitt. Hello from Plymouth! Apologies for having been silent for over a year. I’ll try to do better this time. Rupert, Zest and I have had an eventful 12 months, during which we’ve sailed more than 4000 miles. I have been wanting to write about it, but so much has happened it’s hard to know where to start. We sailed Zest to Plymouth to watch the start of the 2013 OSTAR, the race for which I bought the boat but was unable to join in. After putting in all the effort to prepare for an ocean adventure it seemed a shame not to go on one, so in July we sailed together to the Azores and then Rupert flew home for Cowes Week, leaving me to get Zest back to Falmouth on my own. I managed to complete the passage in 8 days with no incidents, taking more than a day off the time of the outbound trip. After cruising 1200 miles non-stop by myself I reckoned it was time to trying solo racing, and In the autumn I did my first events with the Solo Offshore Racing Club. Rupert and I have also done a number of double-handed races, in the Solent with the Royal Southampton Yacht Club and offshore with JOG. Which brings us up the present, which finds us in Queen Anne’s Battery Marina, preparing to start the 2014 Round Britain and Ireland Race, organised by the Royal Western Yacht Club of England. It starts from Plymouth Sound at noon tomorrow. I can’t believe I’m actually sitting here writing this. You can learn more about this classic event at http://en.wikipedia.org/wiki/Round_Britain_and_Ireland_double_handed_Yacht_Race and track our progress on http://rwyc.org/rbandi/the-race/tracking/. I will endeavour to post updates on our Facebook page athttps://www.facebook.com/SailingWithZest and on Twitter follow @gbr536 if you’re really keen. Finally, we are hoping to raise money for Help the Hospices. I would love to raise at least a quid for every mile we sail. If you’d like to show your support then head on over to http://t.co/Bgv7eQtNIS. Last I checked you lot had a 110 mile head start. Well done. Okay, I’d better get back to stowing. This entry was posted in Uncategorized on May 31, 2014 by Kass Schmitt. It’s mid-afternoon, two days after launch. I am sat Zest’s saloon, trying to contain my anger as I compose an email to the company that appears to have lost the EPIRB I sent to them for battery replacement seven weeks ago. I hear a loud thud on the pontoon and then Rupert’s voice, calmly asking if I wouldn’t mind bringing out some paper towel, ‘the whole roll please’. I arrive on deck to see Rupert hunched over, hand over his bleeding nose. While using wire cutters to cut a new forestay to length, he has managed to launch himself face-first into the pontoon. A few guys who are working on other boats on the pontoon have rushed over to help. One asks if I have a medical kit onboard. Do I ever! Oscar Mead has kindly lent me the kit he bought from Medical Services Offshore for his OSTAR four years ago. Trouble is, it’s massive, and I haven’t taken the time to fully familiarize myself with its contents yet. So I rifle through it, trying and failing to find the antiseptic wipes and steristrips, feeling increasingly frustrated at my ineptitude. We make do with a couple of steristrips, plus a large bandage, and decide it’s worth getting Rupert checked over at the hospital as he may need stitches. At the hospital Rupert is taken through right away, and I sit in the waiting area reflecting on recent events. We are both exhausted, last night we were up until 2AM, assembling bits of the rig in our shipping container workshop as it blew a gale outside. Even if by some miracle all of the remaining equipment were to turn up from the suppliers with all of the bits present and decent documentation, we will still need to spend every available minute installing things. There will be minimal time to test things, and no time to recover from the exertion of the refit. Only a fool puts to sea exhausted. It’s time to stop this madness. I am still waiting. This is taking longer than I expected and naturally I begin to worry. Has Rupert broken his nose? Is he being taken for a scan? How will I live with myself if this injury turns out to be serious? I am reminded of the sad story of Lizzie and Mike McMullen in the 1976 OSTAR. Lizzie electrocuted herself just days before the race, while helping Mike prepare his boat. Mike set out to race anyway, believing that it’s what Lizzie would have wanted. He was never seen again. I feel I am beginning to have an insight into the state of mind that can lead to a tragedy like this. I am choosing not to go there. I step outside to take a call from the service manager responsible for the EPIRB fiasco. He finally admits that they have indeed lost my EPIRB, and apologetically offers to replace it with a newer model at no charge. We discuss the delivery options and timeline and I realize with great sadness that there is no hurry now. My 2013 OSTAR campaign is over. This entry was posted in Uncategorized and tagged OSTAR, withdrawal, Zest on May 20, 2013 by Kass Schmitt. 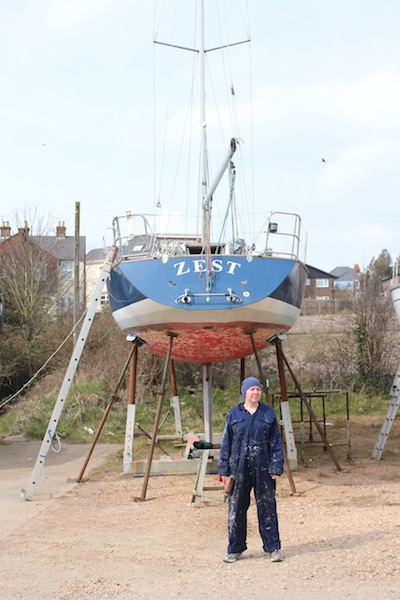 After a nearly two month refit, Zest was relanched on Monday 13 May. I’ve written about the big day on the Boats.com Blog. This entry was posted in Uncategorized on May 20, 2013 by Kass Schmitt. There’s an old saying that ships and men rot in port, and I’m wondering if the same could be said about boat yards. 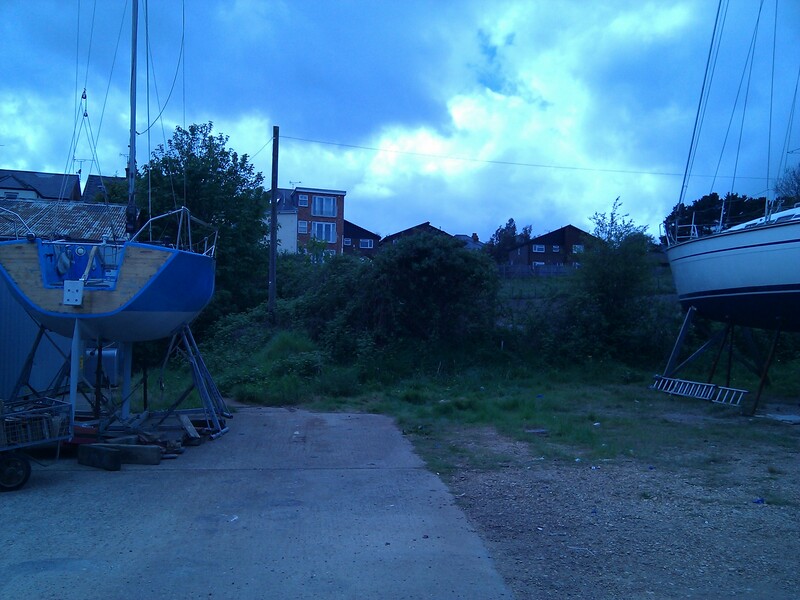 Zest has been out of the water in Medina Yard, Cowes for three weeks now. Don’t get me wrong, Craig Nutter and his team have been fantastically helpful, and there is a palpable buzz in the yard as the boats around us get ready for the season just starting. But the other boats come and go, and we’re still here. Much of the work so far has involved disassembling the boat to get measurements for the new bits that need to be made and then ordering the bits and material needed. We’ve also ordered some new sails, and in the process of choosing a sailmaker from among five hopefuls, ended up with a sports psychologist as well. And boy, could I use one about now, to help me with my nerves, because it does take nerves of steel to stand by and watch all the money drain out of one’s bank account. I suspect this may be the hardest bit, when much of the money has been spent but nothing has been delivered, and all I can do is hope that it will all come together in time. We are asking a lot of our suppliers, I know. Our timeline is ambitious to say the least and this is the busiest time of year for most of them. I am so grateful for all of the goodwill that people have shown towards us and the project and I feel a huge responsibility not to disappoint the many people who have gone above and beyond to help. I do sometimes feel like I have the whole Solent area supporting me, and it is humbling. I’ve even been trading jokes with the @Coweschainferry on Twitter. With help from some of my many talented friends, I have put together a proposal for corporate sponsorship of the campaign. The sponsorship is not strictly necessary, but it will boost the competitiveness of the campaign and help me to tell my story better and more widely. I think it’s going to be a fantastic story, so it seems a waste not to use it as a platform for a brand or brands I love. I’ve got a few of these in my sights, but if you have any ideas please do get in touch. I also intend to set up an indiegogo crowdfunding campaign for all the friends and family who have asked if they can help financially. Finally, I will also be continuing to raise money for my favourite charity – Help the Hospices – so keep an eye out for my JustGiving page, a link to which will appear here soon. This entry was posted in Uncategorized and tagged boat fixing, OSTAR, sponsorship on April 7, 2013 by Kass Schmitt. This Sunday morning found me in non-descript business park tucked away in an armpit of Staples Corner, just off the North Circular. I was there with eight other boat owners to attend a course on mast climbing and descending techniques, organised by the Cruising Association. 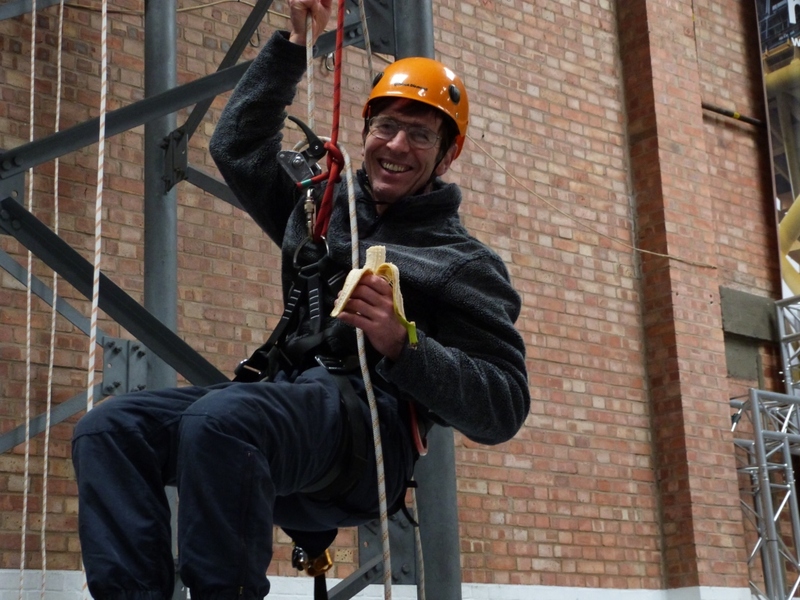 The instructor, Barney Green, is the owner of Higher Safety, an independent height safety consultancy, which works mainly in the construction industry. Barney is also a keen sailor and boat owner, and so is probably more qualified than just about anyone to teach about working safely aloft. We started in the classroom with introductions and a presentation from Barney which covered the basic principles of working safely at height and the equipment we would be using, including a harness, ascender and descender. We then went downstairs and had a ‘horizontal’ practical session. 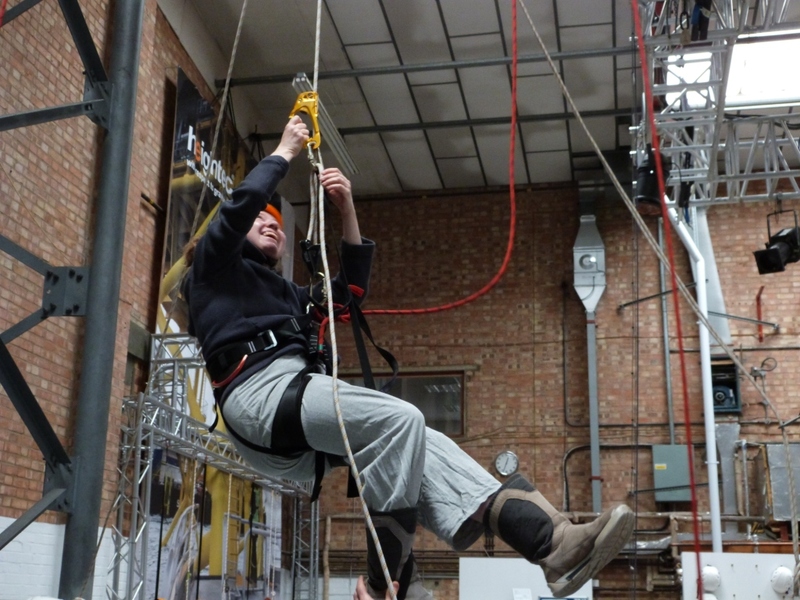 Sadly this did not involve a kip, but rather trying out the equipment on ropes while still on the ground. After that it was time to don helmets and get climbing. Some took to this with monkey-like ease, while others found it a bit of a struggle. I was somewhere in between, finding that it took a bit of thought and some effort, but confident that, with practice, it would become second nature. We each got to try a few variations, including techniques for safe solo climbing, if desired. I sincerely hope I will not need to go up my mast while alone in the middle of the Atlantic, but if I do, at least now I’m better prepared. We then returned to the classroom for a chat about techniques for working at the very top of our masts. This was followed by a lunch break, during which my leftovers from a recent visit to Mosob were the object of some envy, and then more climbing practice. I think the course was a really good investment of time and money for me. Barney is planning to start offering the course more widely, and I would heartily recommend it if you’re into that sort of thing. This entry was posted in Uncategorized on March 11, 2013 by Kass Schmitt. Step one of becoming the captain of one’s own ship is, of course, procuring the ship. For me the process started with a bit of seemingly innocent browsing of various used boat websites. This often took place, if I’m perfectly honest, in bed on weekday mornings, as I sipped a mug coffee and put off the start of my dreary 90 minute commute. Offshore racing has very strict rules about what makes a suitable boat, and these rules are usually pretty difficult for smaller boats to satisfy. As my budget was very limited, this meant my choices of acceptable and affordable boats were pretty restricted. 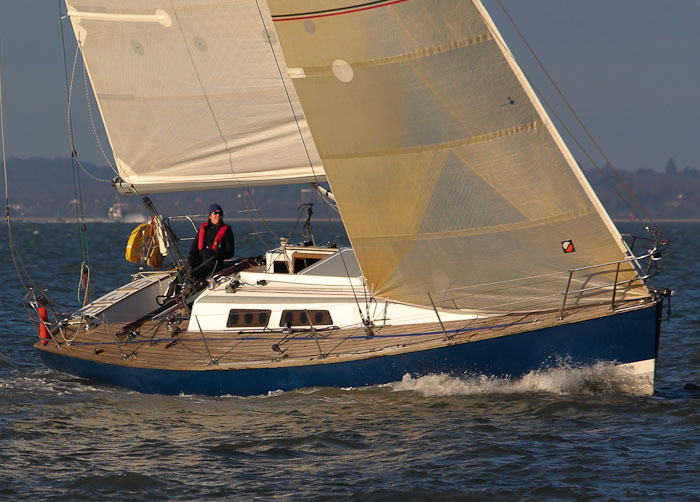 We were eyeing up models like the Jenneau Melody and the Beneteau First 345, of which there were typically a handful for sale in the UK, Ireland and on the Atlantic coast of France. In November, while on holiday to our usual cruising ground in Greece, we heard about a Melody that had been recently bought for a good price and fixed up in our local boatyard. The boat was not for sale, and the owners were off home before I arrived, but told mutual friends I was welcome to have a nose around on deck in their absence, just to get a feel for it. So one evening we took a dinghy across Vathoudi Bay to the local rustic boatyard, full of hungry mosquitoes in the fading light, and I climbed up a rickety ladder onto the deck. I imagined myself alone on this boat, steering across the waves of the North Atlantic, which was not so easy with the olive tree just off the port quarter. The cockpit felt reassuringly small and protective, good for stormy conditions, while the expansive foredeck offered plenty of lounging space for calm, sunny days. There were rumours that this boat had been designed specifically for the OSTAR, with a deep keel and high ballast ratio. Looking around the deck I could believe that. It had the feeling of a well-engineered, mass-produced tool. It would do the job, even if it wasn’t particularly exciting. On our return to the UK we started making tentative plans to spend a weekend or two jetting off to similar boats that were actually for sale. But before we had a chance to surrender ourselves to Easyjet, our heads were turned by a couple of intriguing boats much closer to home, on the south coast. Both were pedigree racing machines, designed by top names, and custom-built with no expense spared. Both had recently had costly refits, only to have the owners’ racing aspirations curtailed, in one case by the sudden death of the owner and in the other by the birth of a child. I bought the first boat we looked at. It took about five weeks from seeing it to becoming the owner. The asking price was about 50% more than I could afford to pay, but for some reason Diana, the original owner’s widow, agreed to sell to me anyway. I am extremely grateful to her for that, and my gratitude just increases the more I learn about the boat (and the more knowledgable people come visit and tell me what a great boat I have). I realise I have said almost nothing about the boat so far. Don’t worry, (much) more soon. This entry was posted in Uncategorized and tagged boat buying, OSTAR on March 2, 2013 by Kass Schmitt.